It was a quiet week around here. I actually ended up working from home a couple days this week since no one was at the office (and our heater is broken, so it's like working on an iceberg). We also close early today, so I get some extra time to plan my New Years' Menu! 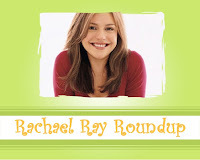 Here's the last Rachael Ray Roundup of 2006! If you try any Rachael Ray recipes at your own New Years party or write any posts about her or her recipes, please let me know so that I can include it in the Roundup. You can email me at everythingrachaelray at gmail dot com. Happy New Year! Nicole Weston of Slashfood featured Rachael's republished Rachael Ray's Open House Cookbook: Over 200 Recipes for Easy Entertaining as the Cookbook of the Day. After a little debate in the comments here, the Home Cook at A Taste of Home tried Rachael's Canadian Bennys. She made some little tweaks (which is always a good idea) and they were "insanely good." A chef who assisted Rachael Ray at a cooking demonstration told the Daily Press: "Rachael is funny and loves to make people laugh," Dalton said. "She's also loves to eat but burns it off quickly. Rachael had brought a couple of assistants, but I don't know why. She didn't need them." The Gossip Girls inform us that Rachael Ray was spotted "shopping at Kinetix Clothing Trunk Show at Lisa Kline in LA." Rachael Ray's growing popularity made the top ten food stories of the year list, according to the Charleston Daily Mail. Rachael is also on advertising agency JWT's list of 70 "in" products, which are "services and trends that will help to define 2007." Becky of Key Lime & Coconut overcame her dislike of Rachael Ray to admit that her Chicken Tortilla Soup with Lime recipe was quite yummy. Don't worry Becky, it's only a matter of time until you convert to being a full-fledged Rachael Ray fan. Rachael Ray Talk Show Ratings Update: Variety says that while her ratings dipped 5 percent to a 2.1 in New York City, the national ratings went up from 2.1 to "its highest ratings in 10 weeks (3.7/15)." It was a belated Rachael Ray Christmas for Cate of Sweetnicks. She tried two recipes from 2, 4, 6, 8 and the Neighbor Husband tried one from Guy Food. Eating Well on Dialysis is back with a recipe adaptation of Tuna and Shells. Star Magazine reports that Rachael Ray beat Martha Stewart in a Parade Magazine poll asking readers whether Rachael or Martha would be a better New Years Eve Party hostess. The folks over at I'm Not Obsessed are having a spirited debate about this result. 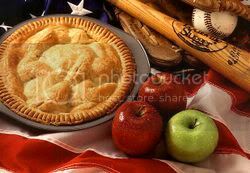 Jesee Henthorn at Jesse Henthorn Publishing is trying out the recipes in 2, 4, 6, 8, one at a time. The first test was of mozzarella and ham in a carrozza and it was "a pretty good ham and cheese sandwich." Ooh no heat in your office?? I can't imagine. HOpe you have a very happy New Year! Ummm, yeah. It really stinks. They gave us these dinky little space heaters so we don't freeze! I hope you have a wonderful New Year, too! This is a great site. I mainly am interested in people's takes on her recipes so I know which ones are good to make. I have made many many many. I see you have a small section on that. Are there any other forums that soley discuss recipes? thansk. I haven't seen a forum talking about her recipes, which is one of the reasons I started Everything Rachael Ray. Maybe someday I will start a forum, too. On the Food Network, there are reviews of her recipes, but lots of anti-fans go there, so it's not really reliable.